In a time when the front-row seats at fashion shows remain for celebrities and movie stars, it is clear that fashion as an industry needs to pitch a different approach to its most viable “backers” — the actual customers. Yes — you read that right. Aside from all the promotional aspects of fashion week events and designer shows, lies the need to fulfill one’s biggest desire when it comes to fashion — wearing pieces that look and feel good. As simple this idea is, the number of fashion brands is constantly rising, which sets the bar higher when it comes to advertising. Luckily, the new frontiers in the marketplace like Dior, Balenciaga and even Top Shop, know how to make the most of their advertising methods. Thanks to the fast pace of technology and the introduction of Virtual Reality (VR) gear, these brands have a unique perspective on their branding — specifically at fashion shows and events. So, What’s The Link Between Virtual Reality (VR) And Fashion Week? Not only virtual reality devices — but wearable technologies in general — seem to be one of the biggest drivers of new trends in fashion nowadays. But, are you wondering why brands love adopting smartwatches and VR headsets so much? The answer is, they offer a different experience that is unlike any other in terms of promoting a store or its products. Virtual reality is so real nowadays, that it can be used in a similar way to actual showcasing. In other words, brands like Dior, Balenciaga and Top Shop found that the VR headset experience gives their potential customers a unique and totally personal “in-store showroom experience,” which definitely works for fashion and fashion-related products. On top of that, virtual reality helps customers view different outfits — whether by swiping right or left with their hands or by being actually present on a fashion show showcasing the looks of the upcoming season. 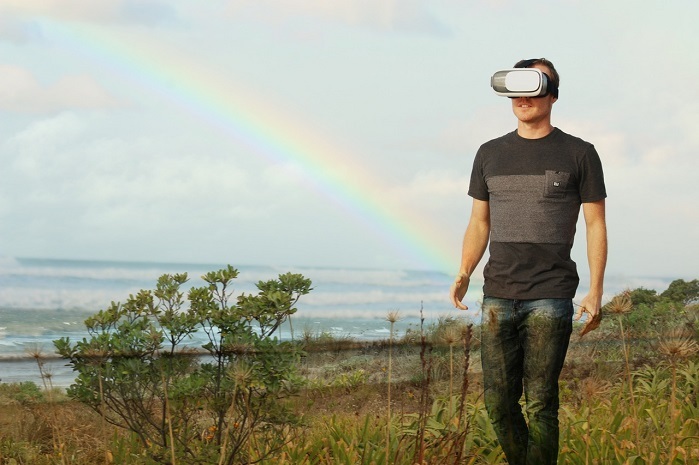 The real-time sharing, as well as the “realness” of this technology, transformed virtual reality from a product of entertainment — in other words, to a powerful marketing model. So if you haven’t gotten the chance to see how VR works for fashion brands and be in the shoes of their “potential customers,” you have to test it out. Probably the coolest feature in the entire model is the concept of virtual fitting — which eliminates the hassle of trying on dozens of outfits to check out whether (and how) they fit. Instead of that, the VR headset showcases the outfits as they are currently on you — all through the power of augmented and virtual reality. As we said above, the real benefit customers are reaping on here is the futuristic and amazingly real (however virtual) reality which no one could have predicted. Not to mention the state of excitement when seeing it with your own eyes. Now imagine bringing some of these experiences to fashion week. Or, better yet, a fashion week that is entirely “virtual.” Virtual Reality Fashion Week is born. Will VR Sales Continue To Go Up? Although we cannot give a 100% accurate answer on this, we have pulled some stats about VR headsets which in this case, are the main driver of this trend. According to a forecast made by KZERO, sales of VR headsets will get to a point of 22.5 million units by 2018. This, compared to the actual 8 million units sold by now, is an accurate factor and a great potential for people to see and take advantage of. Aside from its recent boom in digital marketing and its appearance into our everyday lives, virtual reality has gotten its way into fashion — and fashion week — as well.